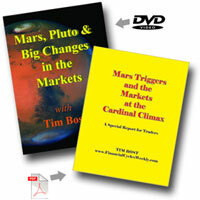 This informative combo pairs the Mars, Pluto & Big Changes in the Markets DVD with the Mars Triggers and the Markets at the Cardinal Climax E-book, at a special limited-time price that saves you over $60! A top-notch tool for astro-traders! This power-packed DVD highlights the critical roles that Mars and Pluto play in moving the markets. Loaded with specific facts and trading strategies for the S&P 500, the Hong Kong Hang Seng Index, the Mumbai SENSEX, and Gold, this informative disc also includes a listing of key dates to watch for upcoming Mars and Pluto activations. A special report highlighting the role that Mars triggers play during the Cardinal Climax to create remarkable trading opportunities. Plus a special section on the important Mars triggers to the horoscope of the solar eclipse of July 11, 2010. This is a high-powered money-making report you won't want to miss! PLACE YOUR ORDER FOR THIS SPECIAL COMBO PACK NOW!